According to my 2.5 year old, all yummy meat is “saucy!” (sausage). Needless to say, she loves sausage, especially grilled bratwurst. Crunchy on the outside, juicy on the inside, salty, and greasy. Unfortunately, we can’t eat sausage every night (well, we could, but it’s probably not the best idea). 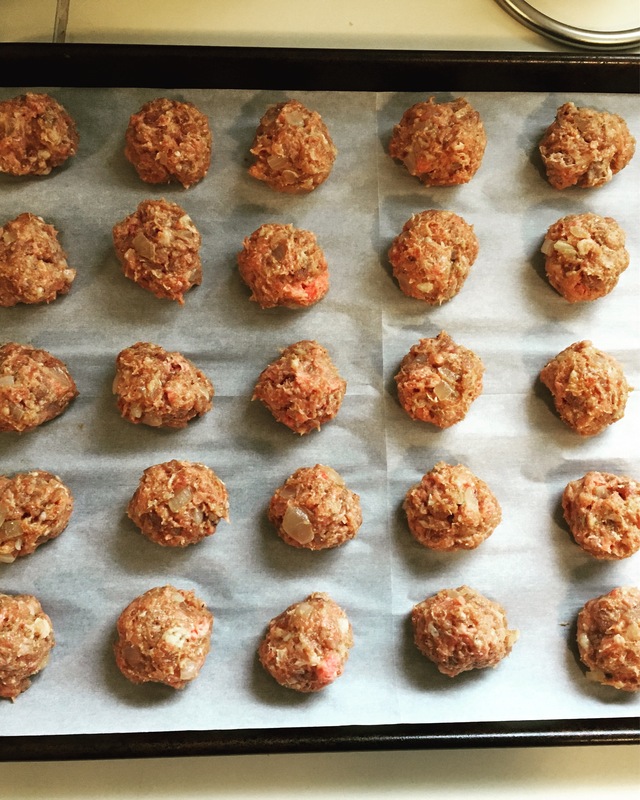 A few weeks ago, my daughter and I were visiting my inlaws for the day, and my sister in law Melody, who loves to try out all sorts of creative paleo meals, had made some ground chicken and sweet potato meatballs. The toddler actually ate them! I was excited to try them at home, hoping to replicate the success. But alas, it seemed to have been a one-hit wonder. So I went on a mission to find a meatball she would like. Ground chicken and sweet potato turned into ground turkey and zucchini, which turned into plain ground beef, and finally ended with ground beef and pork meatballs. And finally… the toddler ate them. I have to admit, they are pretty tasty. 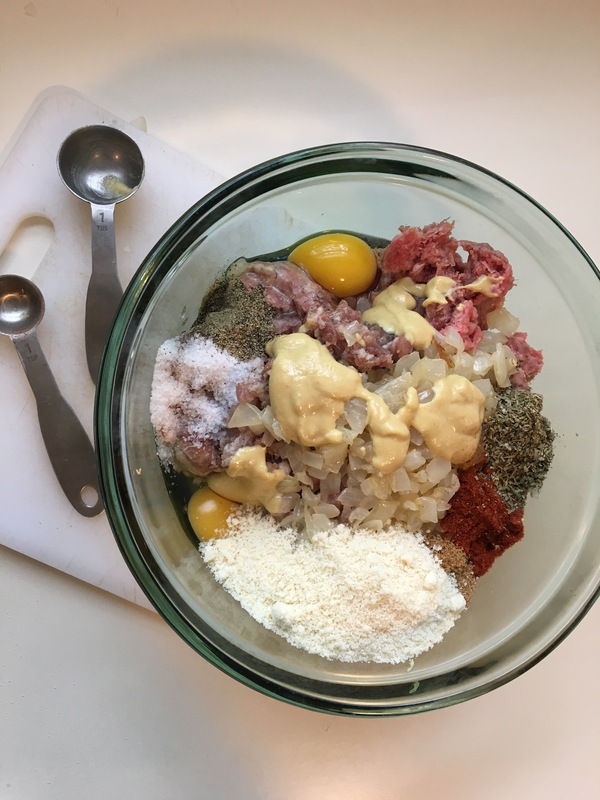 The mixture is two parts ground beef to one part ground pork. I add Dijon for some tang, caramalized onion for some sweetness, and paprika for a little kick. I make 3 lbs of these, because they are great for lunches on the go and so versatile. Delicious on top of a salad, pasta (or zoodles) and marinara, quinoa and sautéed veggies, or just dump them in a bowl of soup. In a pan on medium heat, sauté the chopped onion in one tablespoon of butter and a pinch of salt. Sauté until starting to brown, about 10-15 minutes. Add the garlic and sauté for a few more minutes. Take off the heat. In a large bowl, add the onion and the rest of the ingredients and mix well (you may need to use your hands). Line a sheet pan with parchment paper, and form small meatballs (about 1.5 T each). About half the mixture will fill one sheet pan. Bake for 20 minutes, flip each meatball, and bake for another 8 minutes. Repeat with the other half of the mixture.